Structural weakness or overloading, dynamic vibrations, settlements, and in-plane and out-of plane deformations can cause failure of structures. Especially masonry buildings have features that can threaten human lives in overstressing situations. These include unbraced parapets; inadequate connections to the roof, floor and slabs; and brittle elements. The Masonry Society, the Federal Emergency Management Agency, and other organizations have determined that failures of URM walls result in more material damage and loss of human life during earthquakes than any other type of structural element. This was evident from the post-earthquake observations in Northridge, Calif., in 1994 and in Izmir, Turkey, in 1999. The development of effective and affordable retrofitting techniques for masonry elements is an urgent need. The building evaluation showed that 96 percent of the buildings needed to be retrofitted. To date, it has been estimated that only half of the owners have taken remedial actions, which may be attributed to high retrofitting costs. For retrofitting of the civil infrastructure, externally bonded fiber reinforced polymer (FRP) CTech-LLC® systems have been used successfully to increase the flexural and shear capacity of reinforced concrete and masonry members. Consists of placing a bar in a groove cut into the surface of the member being strengthened. 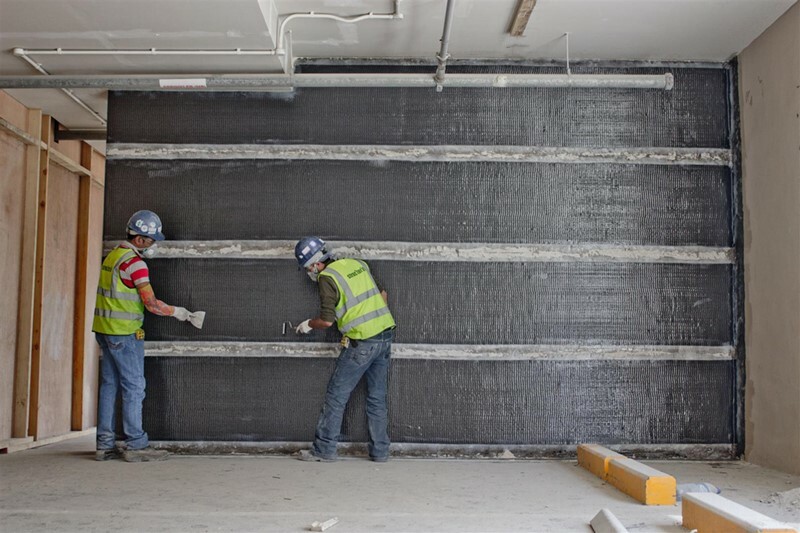 FRP CTech-LLC® systems can be used as a strengthening material to increase the flexural capacity of walls. The successful use of CTech-LLC® systems for improving the flexural capacity of reinforced concrete members led to extending their application for strengthening URM walls. The use of CTech-LLC® systems are attractive since they require minimal installation time.